Notice that by default, the annotation description is enabled. 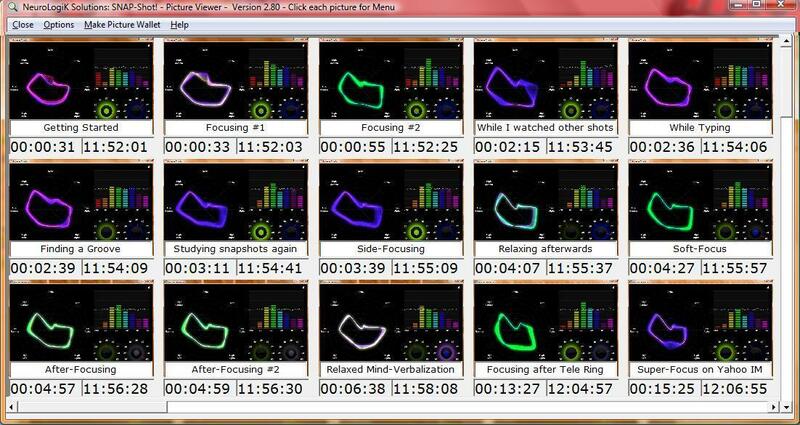 This is useful for taking a picture of the entire window showing the annotations for each picture. As you can see, the annotation overlays the bottom of the picture, which is why you might desire to eliminate the description for overall screen snapshot purposes. The Load Picture menu option (Ctrl-L) allows you to replace the picture with a different image from anywhere on the hard drive of your computer. The Clear Picture menu option (Ctrl-X) allows you to clear out a picture that you don't want to keep. Should you later choose to save the pictures as a group, you will receive a warning error when the viewer screen attempts to save this [now] non-existent picture. The Clear Picture and Shift menu option (Ctrl-Y) also allows you to clear out an unwanted picture, but also shifts the remaining pictures left one postion to elimenate the gap between pictures. The Save & Clear menu option (Ctrl-E) allows you to save a picture and then clear it out. Like the Ctrl-X option, should you later choose to save the pictures as a group, you will receive a warning error when the viewer screen attempts to save this [now] non-existent picture. 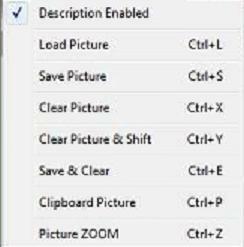 The Clipboard Picture menu option (Ctrl-P) allows you to copy this picture back to the Clipboard. One use of this feature is that you can then use this picture with the Shift-Click option of the Snapshot Screen, putting a new copy of this picture at the end of the viewer screen's group of pictures. The Picture Zoom menu option (Ctrl-Z) allows you to Zoom in on the thumb-nail image for a more detailed look at its content.